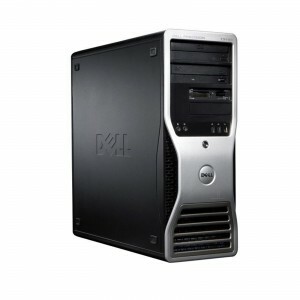 The Dell Precision T3500 is designed to provide productivity gains with performance and scalability well beyond the range of standard business desktop PC’s. Certified by independent software vendors (ISVs), the T3500 was designed in co-operation with those who know how to get the most out of, ensuring it will perform reliably on the whole spectrum of workstation applications from digital content creation to multimedia production and computer aided design (CAD). With support for dual-core, quad-core or 6-core Intel® Xeon®3500/3600 series processors, up to 24GB of DDR3 ECC memory and dual PCI-Express Gen2 graphics slots. The T3500 features the latest Intel architecture for fast, energy-efficient performance on demanding 64-bit virtualized applications. Expansion options are not lost on the T3500’s compact dual orientation desktop/tower design build, dual PCIe x16, dual PCIe x8 and dual PCI slots on the dense system board. On-board SATA RAID controls up to four 2TB SATA II hard disk drives at 3.0GB/s for enterprise class storage and eleven USB ports provide connectivity for all your business peripherals. We appreciate that when choosing your business workstation you have certain unique requirements that can’t always be met off the shelf. Using the Bargain Hardware Configure-To-Order (CTO) dropdown options you can build your ideal refurbished Dell T3500, balancing your budget and performance priorities and leaving us to do the rest.